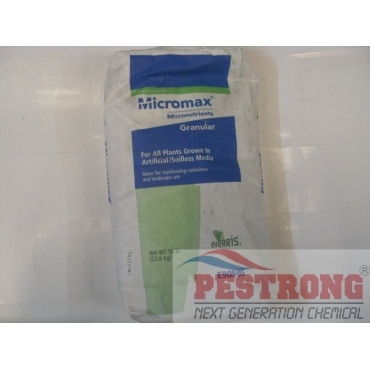 Where to Buy Micromax Fertilizer, Micromax Micronutrients Granular Fertilizer - 50 Lb - $129.95 for Sale with Fast Free Shipping! Micromax Micronutrients Granular Fertilizer - 50 Lb is specially formulated to improve the overall performance of your major nutrient program. This leading homogenous granular micronutrient fertilizer maximizes sulfated elements for optimum plant utilization and prevents micronutrient segregation. This is a good product for general nursery and greenhouse production when additional micronutrients are desired or required. The unique granular formulation of Micromax is designed to increase the efficiency of the major nutrient program and to maximize plant growth by boosting micronutrient levels in the root zone. The homogeneous nature of the product ensures each granule contains all the secondary and micronutrient elements listed on the label for maximum consistency when mixed properly. USE ON: nursery stock, foliage and landscapes. The combination of Micromax and Osmocote Classic will lead to optimum crop performance. You can use Topdress Special also. Good product. Has a bunch of nutrients that most other fertilizers don't. Micromax will be a great addition to my nurseries. Great price + product!